In a game of massive pendulum-like runs, haymakers, body blows and murderous uppercuts, Indiana lost the battle but served notice it will continue to fight the good fight. Michigan State 80, IU 65. But it was infinitely closer than that. 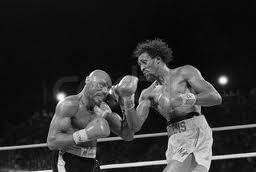 In the end, Michigan State was Hagler, Indiana was Hearns. Things like not getting to the free throw line, something they've done extraordinarily well all season. The Hoosiers hit five of just nine attempts. Things like not winning the turnover battle. IU turned it over 13 times, Michigan State nine. Things like not matching Michigan State's physicality and inside presence both early and late in the game. Michigan State's frontcourt was dominant. Things like not scoring from behind the 3-point arc, something they've done better than anybody else in the country: IU was 6-of-17. They didn't get much from Cody Zeller. Was this unexpected? Not in the least. As good as he's been through 12 straight wins, he's never seen anything like this. He's never faced this kind of crowd, and he's never faced this kind of opponent. Welcome to big-time road basketball in the Big Ten, kid. "It's hard to play on the road for your first Big Ten game,'' Michigan State coach Tom Izzo said. Zeller knew this going in, having grown up in Big Ten country: Big Ten road hoops is a different animal altogether. No conference scouts, coaches and prepares like they do in the Big Ten, and Zeller wasn't quite up to the massive challenge. Over time, he will be. Crean called him "a fast learner,'' and there's little doubt he will be better on the road as the season, and his career, move on. For one night, though, it was rough going for one of the top -- if not the top -- freshman in the country. He got two fouls early. He picked up a third foul early in the second half. It was an un-Zeller-like line: four points, three rebounds, and he got worked over pretty thoroughly by Michigan State's big men, namely Derrick Nix (14 points) and Adreian Payne ( eight points). Ultimately Michigan State did what Michigan State does: The Spartans fought back from IU's massive run, clamped down, started to rebound and took over late. But the Hoosiers did the kinds of things that make you believe they are headed toward the upper levels of the Big Ten. If IU had gotten blown out, and that's the way it was looking through the first 15 minutes of the game, it would have been suggested the Hoosiers were the product of an ordinary nonconference schedule (Kentucky excluded). But this group is for real. Zeller might be "a quick learner,'' but there is the sense this entire team has a pretty good basketball aptitude. If they could come back after years of getting sand kicked in their faces, they can come back from this. All losses sting, but this shouldn't sting too badly. Even if they lose their first two Big Ten games -- they've got the conference's best team, Ohio State, Saturday night in Bloomington -- this group will be making noise well into the springtime. To beat Michigan State in the Breslin Center, to win after overcoming an 18-point first-half deficit, greatness is required. The Hoosiers got that from Christian Watford, who keeps growing every game and scored 26 points. They got an excellent, gutty game from Verdell Jones III, who had 11 points despite an injured hip flexor. They got some nice work from a bench that was depleted by the absence of injured Will Sheehey, getting some big 3s from Matt Roth and quality defense from Tom Pritchard. For most of the night, IU did most of the things a team has to do to compete with the Spartans, namely rebound and match their ample physicality. But Zeller never quite got it going. Some of it was courtesy of teammates, who never got him the ball and too often took bad angles getting it inside. And a lot of it was Zeller, who didn't demand it, who failed to seal on the post and never got position deep inside. Despite the outcome, IU is still writing the biggest, best turnaround story in all of college basketball now. And they are writing it with passion, with the kind of mental toughness you couldn't have expected, with resilience and athleticism and belief. Ohio State is still the cream of the crop in the Big Ten, and that doesn't figure to change any time soon, but IU and Michigan State will hang around and fight for the next few spots. It's just the first round, with 17 more to go. The Hoosiers don't have a glass chin, anymore. Bob Kravitz is a columnist for The Indianapolis Star. Call him at (317) 444-6643 or email bob.kravitz@indystar.com. You can also follow Bob on Twitter at @bkravitz.